Whenever an employer uses a background check to make a decision that is not in favor of the applicant, the employer is taking Adverse Action and must follow certain rules to maintain compliance; there is no exception to this rule. 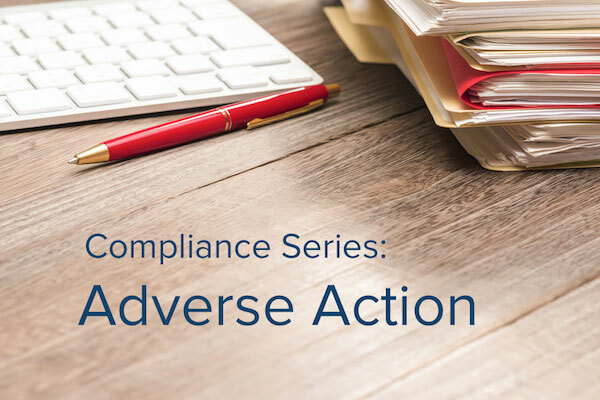 In the following article, we will discuss Adverse Action Compliance as dictated by the Fair Credit Reporting Act, FCRA. Depending on where you operate or where your applicant resides, you may be required to meet local Adverse Action regulation, such as the New York City Fair Chance Act Notice. For example, local laws may require employers to make a conditional offer of employment before conducting a background check, which you will need to factor in to your Adverse Action Policy. It is the recommendation of Choice Screening to consult an attorney or qualified personnel familiar with local legislation to ensure you are meeting all federal and local Adverse Action standards. As we are not attorneys here at Choice, we cannot provide legal advice. The FCRA specifically outlines the process and requirements for taking adverse action to accomplish three primary goals: (1) inform the applicant of their rights under the FCRA, (2) ensure the applicant knows adverse action was taken based all or in part on the results of a background report and (3) allow the applicant to review the background report and dispute any inaccuracies. Inherent in the adverse action process is giving the applicant the ability to correct inaccurate or incomplete information that could, in the long run, influence your decision to continue with an offer of employment. This is arguably the most impactful goal of adverse action, offering protection for the employer (that the decision was made on accurate information) and the subject of the background report (that they were given the ability to confirm everything was accurate). The Pre-Adverse Action Letter informs the applicant that an employer is going to take adverse action. Similarly, the Post-Adverse Action Letter advises the applicant that the final decision not to pursue employment has been made. (Components of the letters will be discussed next, don’t worry!) The middle step – waiting – is the most challenging and complex. First, how long and employer must wait is only defined as a “reasonable amount of time.” For the most part, employers have been found liable for FCRA violations when they proceeded with taking final action in less than four business days. However, some courts have ruled ten business days is reasonable. Local laws tend to be the best indicator of how long you should wait so be sure to investigate these when establishing your policy. What happens during the Waiting phase of Adverse Action? This is a very important question. Often times, nothing. Sometimes, a dispute could be filed. If the applicant identifies anything inaccurate or incomplete on their background check, they have the right to file a dispute with the Consumer Reporting Agency, CRA, that provided the report. The CRA then takes steps to verify the information and issue amendments to the report as appropriate. Here is a great article that provides in depth discussion of the dispute process. It is the employer’s discretion as to what should be done while a dispute is in progress, such as proceed with taking final action regardless, wait until the dispute is complete, or make a conditional offer of employment. Each option carries varying degrees of risk. As a result, it is important to have a clearly written policy on how you handle disputes during Adverse Action. If a circumstance arises and you’re not sure how to proceed, it may be a good idea to get legal advice or talk to someone internally who’s qualified to make decisions in these circumstances. What’s important to realize is that making the wrong decision could result in discrimination allegations or FCRA violations in the worst case scenario. Pre- and Post-Adverse Action Letters have the same four components, as listed below. A letter stating adverse action has or will be taken that advises the applicant the employer made the decision (not the CRA) and provides the CRA’s contact information. The only difference is the Pre-Adverse Action Letter advises an applicant that you plan to deny employment and the Post-Adverse Action Letter advises you have made a final decision. Although not required by the FCRA, some local laws require employers to specifically inform an applicant why adverse action as taken. In short, CRA’s are prohibited from making an employment decision for an employer according to the FCRA. We strictly serve within the scope of providing information on a background report. So if we are asked, “Should I hire this applicant,” a CRA isn’t allowed to give you an answer without inheriting a relatively substantial risk. That being said, one of the biggest benefits of working with a CRA is, not only that we provide you with an easy to use report and a wealth of reliable information, but we can help you understand the results. If you’re not sure what a criminal record means or need help interpreting a credit report, our team receives extensive and ongoing training so we can give you the answers you need. We can even help explain compliance regulation, we just can’t give you legal advice! One of the keys to Adverse Action Compliance is to ensure consistent practice every time adverse action is taken. Considering all the information we just covered, and the random interjections here and there mentioning additional laws could impact how you proceed with adverse action, it’s apparent that a clearly written policy is extremely important. This gives your team a baseline and can help identify non-compliant activity before it impacts a large group of applicants. Do you have to deal with local adverse action requirements? How does your team stay compliant when taking adverse action? Tell us your story! Choice Screening is here to help answer questions you may have regarding Adverse Action and FCRA compliance.